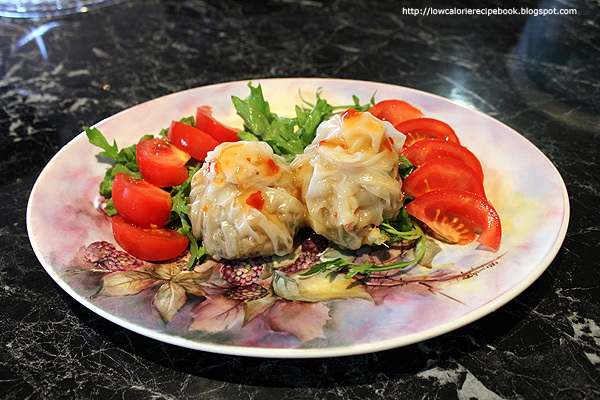 Serving as pictured - 2 dumplings with salad. Slice Chinese cabbage fine and dice stems placing aside in large bowl. In a food processor roughly dice mushrooms and add to cabbage bowl. Then process capsicum, dicing only. Tip capsicum into strainer and discard watery juice. Add to cabbage and stir. Use the processor to process dried tomato, egg whites, basil leaves, chives & sweet chilli sauce. Add to cabbage mixture and stir well. With your hands rub in chicken mince ensuring all ingredients are mixed evenly. Prepare a wide flat tray with warm water and place rice papers beside tray. Lay a clean tea-towel on bench to catch excess water from wrapper. Dip a single wrapper in warm water until it softens and lift out onto tea-towel. Using a 1/4 cup measure scoop out a packed 1/4 cup of mixture and place in centre of softened wrapper. Gather up sides of wrapper and lift into steamer. Twist top of wrapper as best as possible. 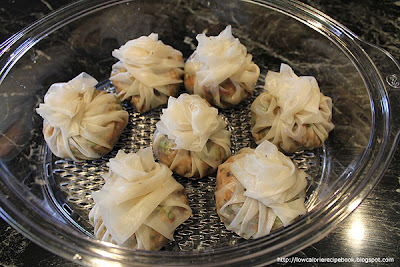 The wrapper will seal as it cooks and the rice pastry sticks to itself. Repeat for the remaining 13 wrappers placing in steamer trays. This will take up 2 trays. Steam for 40minutes and serve with salad. Salad: Prepare each plate with 1/2 cup rocket and 1/2 ripe tomato. Season tomatoes with freshly ground pepper. Freeze cooked dumplings and reheat in oven in a tray covered in foil. They can be fried but the calorie count soars.